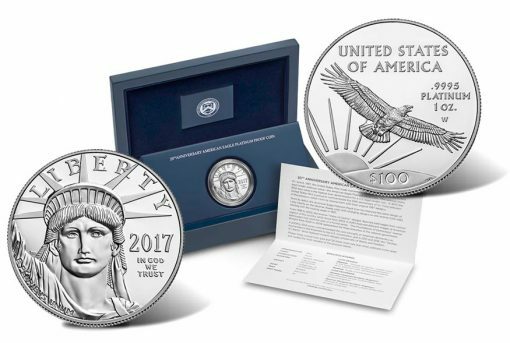 Commemorating two decades since the annual series debuted, the United States Mint’s 20th anniversary 2017-W $100 Proof American Platinum Eagle goes on sale today, July 6, at noon ET. 2017-W Proof 20th Anniversary American Platinum Eagle – coin obverse, case, Certificate of Authenticity and coin reverse. In 1997, the U.S. Mint introduced .9995 fine Platinum Eagles in investor bullion and collector proof editions. Both types shared common designs until 1998 when the proof started its run of annually changing reverses. This year’s anniversary edition departs from tradition by once again featuring the original 1997 designs. 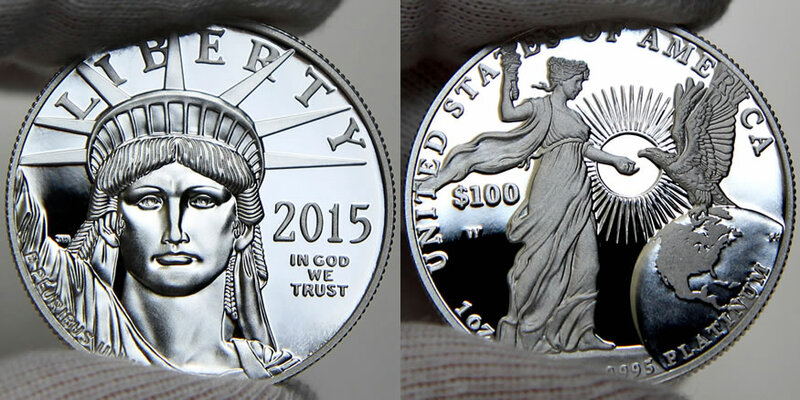 If recent history is any indication, demand will be strong for the 1-ounce platinum coin. Its mintage is 10,000 with an initial household order limit of one. Last year’s piece had the same limits and sold out within an hour of launching. The coin from 2015 had a much lower mintage of 4,000 and attained sell-out status in seven minutes. The obverse (heads side) offers John Mercanti’s "Portrait of Liberty" design that showcases a modern interpretation of the Statue of Liberty. It has appeared on obverses since the series introduction. Inscriptions surrounding the portrait are "LIBERTY," "2017," "IN GOD WE TRUST," "E PLURIBUS UNUM," and JM for the artist’s initials. On the reverse (tails side) is Thomas D. Rogers’ depiction of an eagle soaring above America, last used in 1997. Inscriptions include $100," "UNITED STATES OF AMERICA," ".9995 PLATINUM 1 OZ.," a "W" mintmark that denotes its production at the West Point Mint, and TDR for the artist’s initials. 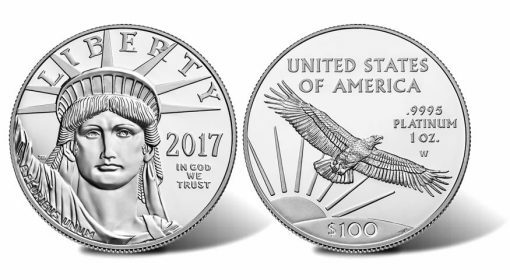 Initial pricing is $1,300.00, which is $50 less than last year’s coin and based on platinum’s current average within $900 to $949.99 an ounce. If it does not sell-out, the price can change weekly based on the U.S. Mint’s pricing matrix and the platinum market. When released, order the proof 2017 20th Anniversary Platinum Eagle from the U.S. Mint via its American Eagle product page or by calling 1-800-USA-MINT (872-6468). Each coin is encapsulated and packaged in a custom–designed lacquered presentation case. A 20th anniversary Certificate of Authenticity is also included. 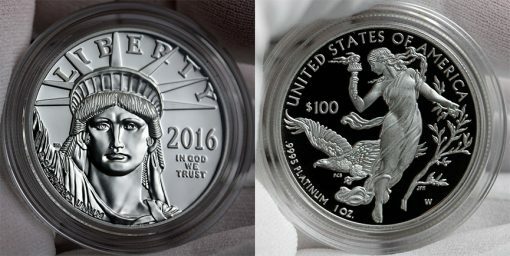 2017-W Proof American Platinum Eagle Poised for 10,000 Sell-Out? The U.S. Mint has had to purchase platinum & gold planchets from the Perth Mint Australia a few times in recent years due to planchet shortages in the USA. The Perth Mint website blog once proudly proclaimed that the U.S. Mint was one of their world-wide customers. Crazy situation. Wow, I didn’t know that! I was under the assumption that the Pt planchets had to come from US sources (which was part of the more recent legislation for the Pd Eagle, since it was penned by Montana legislators whose state contains the Stillwater palladium mine!). The original legislation for the American Eagle gold & silver coin programs that Reagan signed, stated that the precious metal had to be mined in the USA . But, it also stated that the Mint must produce the bullion versions to meet public demand, so to meet public demand they have gone to foreign sources during high demand periods to get the needed planchets. The Mint always finds a way around legal “loopholes” in the law. I left out the complete platinum Eagle burnished collection, that together with the complete proof collection will be 1 of the greatest ever. Platinum rear’est press’est metal. The King of all metal in our world.